Let’s talk about Thanksgiving. I’m ready to enjoy a day spent with loved ones, and get down on some turkey. Maybe get a Turkey Day WOD in, pre-festivities. I don’t host for the big day, but I always try to bring a dish or two to contribute and further spread the paleo love. 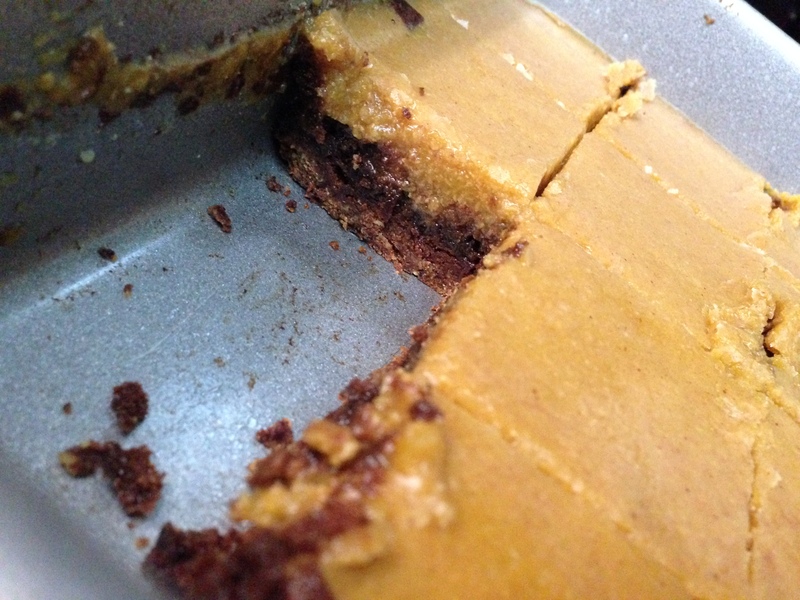 This year, I wanted to perfect a gooey, pumpkin-y, chocolate-y dessert that I could bring a long and not feel tempted by the non paleo desserts. 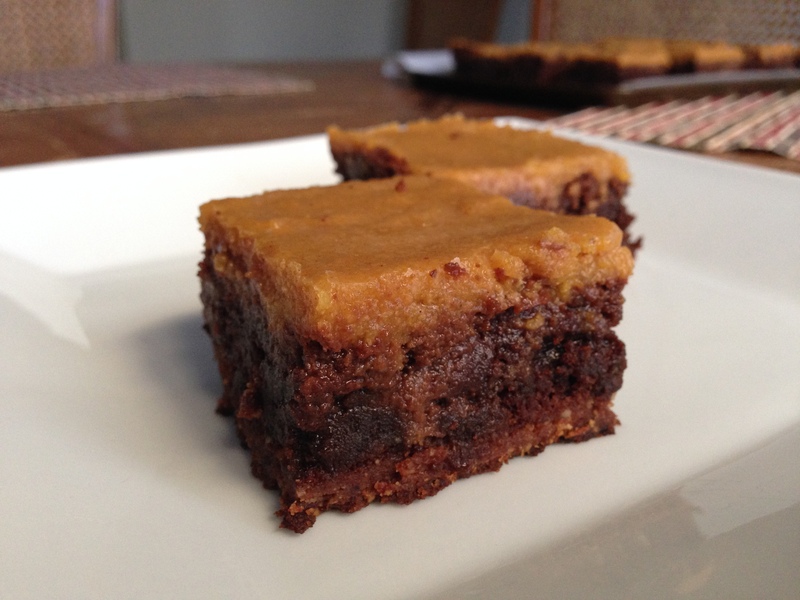 Introducing my Pecan Crusted Pumpkin Brownie Bars…. …Yeah, that’s a mouthful. But when you’ve produced blood, sweat and tears over a recipe, it deserves a long name. I’ve been working on this gosh darn recipe for a month now and each failed attempt had me pulling out my hair. A layer wouldn’t turn out quite right, or something would be off in the flavor department. I was knee deep in maple syrup and pumpkin’d out. Until now, err, Sunday to be exact. I was frantically trying to pull together a dessert recipe for a Thanksgiving potluck at work the next day (which explains the subpar pictures below), and decided to give this recipe one last shot before throwing in the towel. I subbed out a few ingredients, tried a few new things and patiently waited for the final results. After taste testing one, two, a few pieces, I knew I had finally nailed it. The perfectionist in me has won again. …Awkward. This happens at least 3 times a week. But seriously, I’m bringing these to my Thanksgiving festivities because traditional pumpkin pie is SO overrated. And these are good with coffee. And milk. And water, and…pretty much everything. (1) Dark Chocolate Espresso Brownie recipe (omit the chocolate chips). Preheat the oven to 350° degrees (F). Start with the first layer, the pecan crust. Pour the pecans in a food processor with the dates and process on high for about a minute. Then add the remaining ingredients and continue to process until it’s reached a thick and sticky consistency, a.k.a your pecan crust. Press the pecan crust into a 9×13 cake pan and cover the entire pan evenly. Bake at 350° degrees (F) for 8 minutes and let cool while you put together the next layer. For instructions on the brownie layer, please see my post here, but leave out the chocolate chips. When the batter is ready, spread it evenly over the pecan crust. If the crust hasn’t cooled completely, it may stick to the brownie batter and pull as you spread around. Just press it back in and continue to spread the batter carefully. Return the pan to the oven and bake for another 15-20 minutes at 350° degrees (F). The brownie batter should pass the toothpick test when complete. As the brownies are cooling, you’re ready to assemble the final layer! I call this the magic layer. Let’s start with the pumpkin purée. I made my own pumpkin purée by roasting a small pumpkin at 375° degrees (F) for approximately 30 minutes, peeling off the skin and puréeing the flesh. But store bought, organic pumpkin purée is great too. Combine the purée, the maple syrup and spices in the food processor and give it a few good whirls. Then add the melted coconut oil and give it another whirl or two. Pour this layer evenly over the brownie mixture and let set in the freezer for an hour. 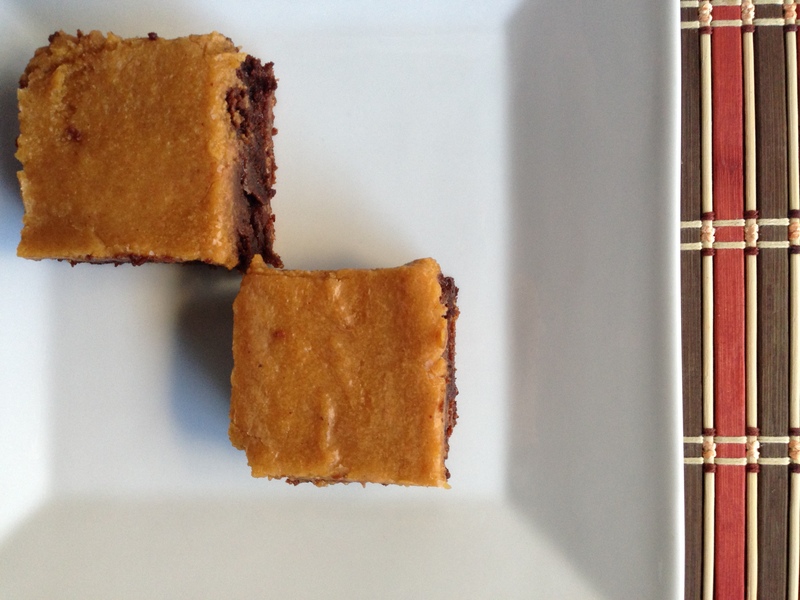 Keep the brownies in the refrigerator to keep that pumpkin layer perfect until you’re ready to cut and serve. Just look at that layered goodness. Enjoy whatever goodies you’ll be getting into and have a very happy Thanksgiving holiday!